AppleWorks refers to two different office suite products, both of which are now discontinued. Originally, AppleWorks was an integrated software package for the Apple II platform, released in 1984 by Apple Computer. 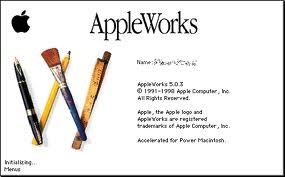 In 1998, the name AppleWorks was repurposed by Apple following its elimination of its Claris subsidiary, which marketed a software package for Macintosh and Windows named ClarisWorks. At one time, AppleWorks was bundled with all consumer-level Macs sold by Apple.